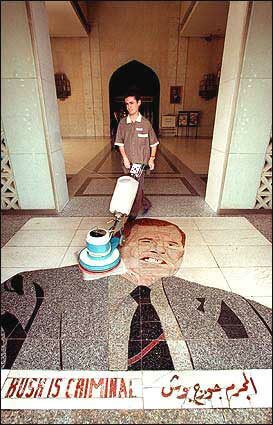 18-storey Al-Rashid hotel in Baghdad was known for its mosaic tiles installed in the foyer, depicting George HW Bush. Tiles – a portrait of former U.S. president with an expression of surprise is made on the floor to the entrance to the hotel to make any visitor to walk on his face. After the invasion of Iraq, a mosaic was destroyed by U.S. soldiers.